I Got a 2 Star Review… and Didn’t Even Flinch. Authors seem to live and die by reviews. That moment you check your amazon author page and see that a new review has come in is both thrilling and terrifying. At least it WAS to me. Now… not so much. You see, two weeks ago, out of the blue, I landed in the hospital for a full week with a severe pan colitis attack. One moment I was running around NYC without a care in the world, and the next, well, I wasn’t. The scary thing is that there is still no real diagnosis, except that I couldn’t eat or drink and the only thing keeping me going for days on end was IV fluids. It was one of the most disgusting, painful, and frankly, frightening experiences I ever endured and needless to say, there were some pretty dark times. I watched my skin dry up before my eyes, my weight plummet, and now even a full week out of the hospital, I’m not back to where I was and the doctor said it could take two to three weeks more to feel like my old self and stop holding my stomach when I walk. Sigh… (I am getting better every day though, so there is light at the end of this tunnel). But, back to the topic of this blog. You see, right before I was admitted to the hospital, I’d just completed a Book Bub promotion for my novel THE HUNT FOR XANADU. The promotion went well and I sold a nice amount of books, so I was expecting some reviews to come in for that, along with the sequel. Well, when I got out of the hospital and finally had the energy to turn on my computer, I decided to pull up my amazon page, and, lo and behold there was a new review for The Hunt for Xanadu. A brand new spanking 2 star. Here it is if you’d like to read it: “This is one of those rare instances where they probably need to make a movie to appreciate this book more poo. Unfortunately the descriptions were hard for me to imagine and found myself glazing over certain areas of the book. This seems like a movie that turned into a book.” Yes, it actually says the word “poo.” I wish they were able to edit themselves so I actually could find out what they really meant to say. Now, in my previous, “un-fighting for my life author brain” I would have freaked out and been so upset by this two star review. Now? I looked at it, and still look at it, and it’s like it has absolutely no impact. I sort of shrug and say, “Meh, sorry you didn’t like it…” and move on. Truth be told, I kind of like the review – the book should be a movie and I’m still happy the person bought it and took the time to read and review it. Come on, not every book has all 5 Star reviews… it also gives my novel some sort of weird validation. Still, the hope is that people will take the time to write a review, even if it is only a few lines. So what I want to leave you with is this. Yes, bad reviews hurt your feelings and impact your rankings, but they mean nothing. Not in the scheme of life. It’s someone else’s perception of a personalized piece of your work, just like artwork, choice of clothing, food, home decoration, anything subjective. Let it go. Read the good reviews. Relish in them. Maybe find something relevant in the bad review to take away, but don’t dwell. At the end of our days no one is going to be bringing up our two star reviews at our eulogies. They’re going to bring up all the wonderful glories we brought to the world. I promise you that. Let’s talk about BookBub: This site offers a free daily email that notifies readers about free and discounted novels. Readers choose the types of books they’d like to get notified about — all across a host of different genres and categories. For an author, you WANT to be on that email list, and you pay through the nose to get on it. They’re very selective and only take about 10%-15% of the submissions because they are too booked to run everyone. Not to mention they are sticklers about quality – your cover has to be strong and you have to have a certain amount of good reviews. Now, every author I know touts BookBub. Everyone said I’d make my money back and thousands upon thousands more if I got in. I was very apprehensive about placing hundreds of dollars down for an ad. I’d done a lot of advertising on various sites over the past three years and I never made my money back on any of them. Not a one. I did free book promotions, too, on KDP Select, thinking it would spur sales of other books. That didn’t happen either. So I tried BookBub. Authors assured me I would make back my investment, and more. So I applied, and applied, and applied again, and I finally got accepted for THE HUNT FOR XANADU. The promotion was March 6th for 99 cents. Things were different about my specific promotion than others successful ones I’ve read about. First, my offer was not free. I was doing the promotion for a discounted book at 99 cents. Second, I didn’t have it on KDP select for the borrows, because I had just uploaded it to ibooks. 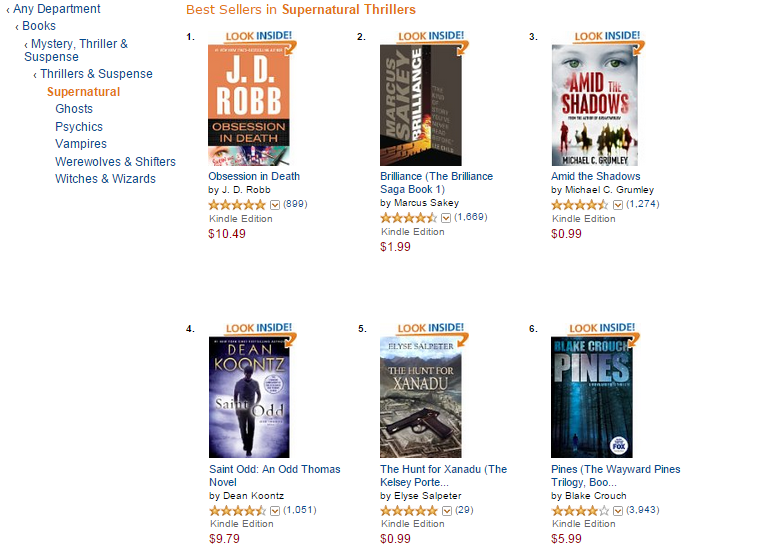 Third, it was in “supernatural suspense,” a smaller category than say, thriller or romance. Fourth, I only gave links to Amazon US, Amazon UK and Amazon Canada. Some would think not making a killing after two days would make this endeavor a failure. It really isn’t. I have to say to myself, “You know what? 572 people PAID for my book so far. And even if I’m out $10 from this promotion (which I won’t be), I have my book in the hands of people that could very well be return customers. If someone told me “Elyse, pay me $10 and I’ll make sure 572 people buy your book,” would I do it? Heck, yes, of course I would. For the exposure to new readers, for the cool screen shots, for the experience. If I’m fortunate, I’ll get reviews and sales of the sequel and maybe they’ll check out my other books. Right now I see 12 sales of the sequel and one or two sales of other books in my inventory. And I finally broke the UK market. I averaged 1-2 sales a month in the UK normally and with this effort I had over 80 so far. That is pretty cool. THE HUNT FOR XANADU will remain at 99 cents through 3/9. I’ll continue this exposure with a social media effort, touting the 99 cent sale to all the boards, google+, twitter – the whole enchilada. Then I’ll also grab the screen shots in Canada and the UK and promote on those specific areas. My hope is I can grab a few more sales. I wanted to hit 700… I still have a ways to go. Feel free to grab THE HUNT FOR XANADU for just 99 cents until 3/9. If you like sequels, THE QUEST OF THE EMPTY TOMB is out as well. If you do read the novels – please consider leaving a review. I’d truly appreciate it. A few side notes: The people at Bookbub are nice, efficient and prompt. I had some questions about the promotion, changed some ending dates, etc. They were extremely helpful, clear and accommodating. My e-mail communications with them were a pleasure. Consider signing up with BookBub for their emails – they really are a great service. Love to hear your experiences with them and if you’ve ever done a paid promotion with them, as well.